"Official" state items are a perennial favorite topic on the 13th Floor -- Kentucky's clogging, Hawaii's humuhumunukunukuapua, Georgia's clay, New Hampshire's pumpkins. But all that isn't going to stop me from doing it again. I was in Maine last week for the first time. (Loved it, btw.) 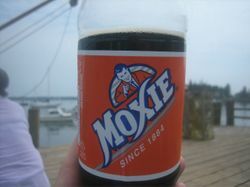 I tried Moxie, a local soft drink that's been around since 1884. It's never been distributed nationally, but it's considered a New England favorite. A lot of people are turned off by the soda's bitter taste. It's like root beer with a bitter aftertaste. Maybe that doesn't sound appealing to you, but I actually really loved it. Like, really. So imagine my gladness when I found out that Maine's state lawmakers had the good sense a couple years ago to designate Moxie as the state's official drink. Oh, here's another fun fact: the derivation of the word "moxie" actually comes from the drink, and not the other way around, as I'd assumed. As far as I can figure, this has to be the only soda whose name has become a word unto itself. And if this isn't enough info for you, here's more Moxiana than you could ever imagine.